The Megaliths of Carnac is a photographic catalogue of megalithic sites - standing stones, stone circles, alignments, dolmen and tumuli - in the Carnac and Locmariaquer region of Brittany, France. The most famous megaliths of Carnac are the Menec, Kermario, Kerlescan and Petit Menec alignments of thousands of standing stones just north of Carnac on the south coast of Brittany between the Quiberon Peninsula and the Gulf of Morbihan. Almost as well-known and just as spectacular are the Marchand's Table (La Table de Marchand) and Great Menhir (Le Grand Menhir Brisé) complex at Locmariaquer and the step-pyramid tumulus containing 23 beautifully engraved stones on the island of Gavr'Inis in the Gulf of Morbihan. The sites were surveyed by the British engineer Alexander Thom who discovered that they are a huge lunar observatory, centred on the Great Menhir at Locmariaquer. This was obviously a very important Stone Age centre and many dolmen (stone passages or galleries), stone circles (cromlechs), standing stones (menhirs), tumuli (barrows), and alignments are scattered over the entire region. 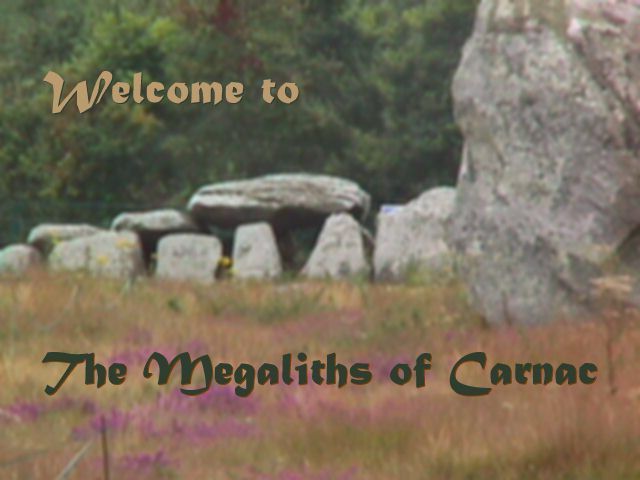 The Megaliths of Carnac web site is divided into 4 parts: an introduction which gives a brief description of the area and a map showing the lunar observatory, a section containing the photographic catalogue with a page for each type of megalith with a map showing the locations of the sites and photos and brief descriptions of each site, a databank listing all the sites alphabetically by name, and a page of links to related web sites. All photographs were taken by myself, during trips to the megaliths of Carnac in 1980, 1983, 1994, 1998, and 2002. All photographs are my property and may not be copied or used without my written permission.